Germophobes, stop reading now. You may want to read about the Jimi Hendrix statue instead. See you later! 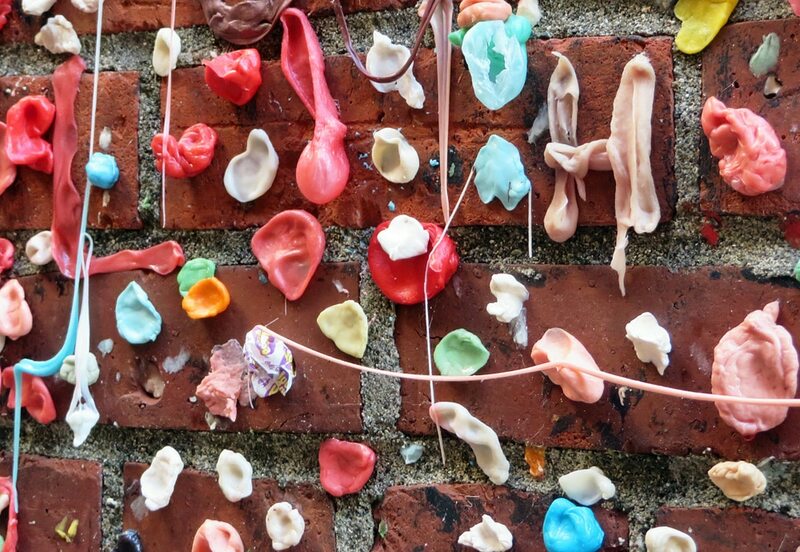 Those of you still here, it’s time to talk about the Seattle Gum Wall, which is achieving a growing level of fame/infamy. It’s become one of the city’s most popular tourist attractions. And it’s literally just a brick wall with chewed gum on it. Conveniently located in an alley right around the corner from Pike Place Market, the Gum Wall is one of the city’s kookiest attractions. It started in the ’90s, and it’s taken off in recent years thanks to social media. People come here to get Instagram photos in front of the brightly-colored wall and to add their own chewed gum to the display. 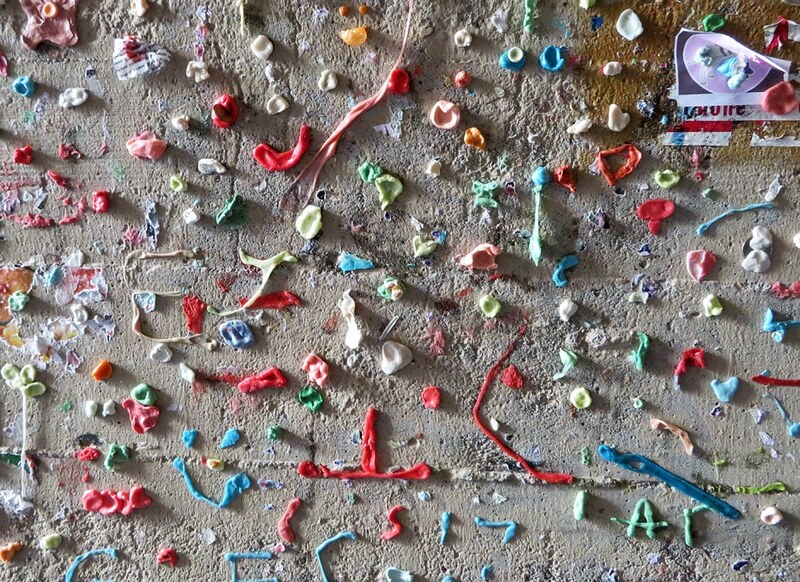 Authorities have on a few occasions removed all the gum from the wall. The last time, the discarded gum total 2350 pounds. That’s more than a ton of gum! But every time they remove the gum, it comes back. At this point, unless they decide to set up 24-hour surveillance, this wall is here to stay. The wall is now cleaned roughly once a year. Walking through the alley is both fascinating and off-putting. Seeing so many colors is cool. The overall mass of the gum is incredible. 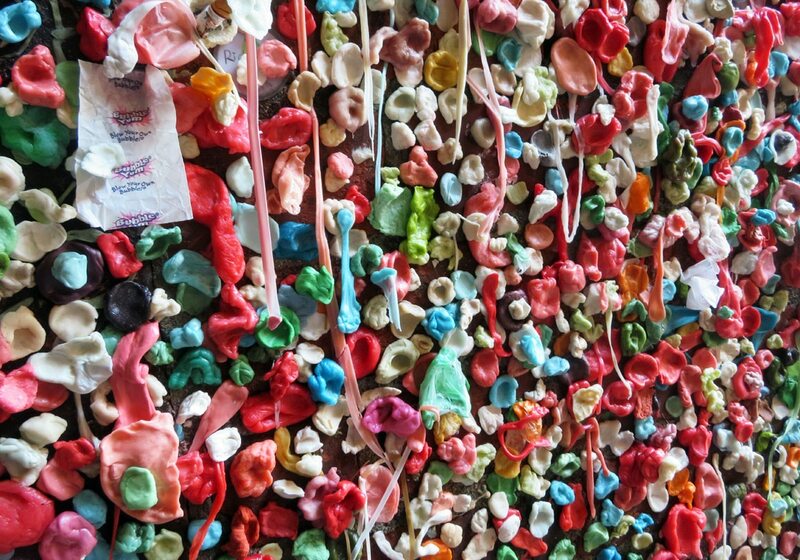 It’s hard to imagine how many mouths all of this gum came from. At the same time, I made sure not to touch any of it, because it’s really gross when you think about it. If you get too close, you can start to smell the flavor of some of the used gum. Yuk! I’m perfectly content to look from a distance without getting my fingers anywhere near this stuff. There’s another famous Gum Wall in the U.S. known as Bubblegum Alley in San Luis Obispo, California. At 15 x 70 feet, that one is bigger and older than the one in Seattle, but Seattle’s wall is growing rapidly. It used to be just 15 feet wide, but now it’s more than 50 feet long. And it’s only growing as hundreds of tourists stop by here every single day. Give the camera to your Instagram husband, and have him eagerly document your addition to the wall. First, you can use the popular “roll your gum into a little circle and stick it flat on the wall” method. Or you can use one of the exposed pipes to do the “drape your gum from a pipe so it hangs like a curtain” method. You can get creative and try the “shape your gum into words” technique. And then there’s the less popular but more visually interesting “blow a bubble and stretch it out on the wall like a blanket” technique. Which of these methods would be your favorite?